Quadrilateral Find Five is a game I developed for my geometry unit as part of my math curriculum. Identifying shapes and being able to connect the terminology with the visual representation are important skills that students must master. Furthermore, using games to teach math has long been a standard teaching strategy. Mathematical game play has been shown to support learners who struggle with motivation, promote positive attitudes toward math, and improve overall learning of mathematical concepts (Davies, 1995). Quadrilateral Find Five provides a fun, engaging way for students to practice geometric naming and identification. Furthermore, providing students with opportunities to learn and hone their game play skills is also important to their overall development. Therefore, having students engage in a game-like activity will also reinforce the social learning of turn taking, sportsmanship, strategic play and peer collaboration. In my own classroom, I have used Quadrilateral Find Five as an independent, stand-alone lesson, as an "early finisher" activity, and as one option in a math game day lesson. I found that my students really enjoyed this activity. As such, I wanted to have permanent game boards available to my students, as well as to be able to eliminate the time spent cutting out the game pieces from subsequent lessons. Therefore, after the first time I played this activity in a new class I would hand out one large zip top freezer bag, and two small sandwich size zip top bags to each pair. I would then ask each player to put their shape word pieces into one of the small bags and place the game board and the bag of shape word pieces in the large bag. This allowed me to easily store the activity for next time. Pair students with a partner and distribute materials. Have the students cut out their own word pieces and have each student place their word cards in their own pile directly in front of them. Explain the rules of the game and highlight the text at the top of the game board where the students can refer to the rules in case they forget. Allow the students’ time to play the game. If time is left, have the students find a new partner and play again. 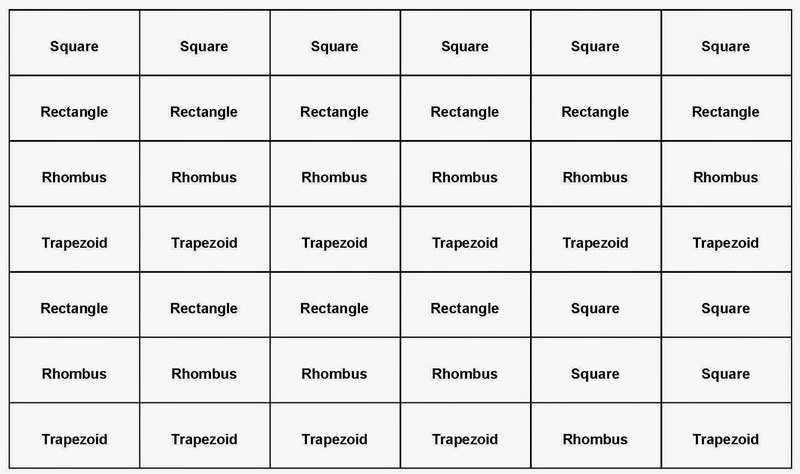 CCSS.MATH.CONTENT.2.G.A.1 Recognize and draw shapes having specified attributes, such as a given number of angles or a given number of equal faces.1 Identify triangles, quadrilaterals, pentagons, hexagons, and cubes.